STOP THE .COM PRICE INCREASE! For nearly two decades Verisign has enjoyed the exclusive contract to operate the .com registry and has reaped massive profits as a result. Their cost to operate the .com registry may be as low as $3 per domain (see – Verisign Reports Fourth Quarter and Full Year 2017 Results) yet they charge $7.85 per .com domain per year as a wholesale price. This is seen by many as effectively, a multi-billion dollar “tax” on Internet users. Verisign is expected by many to request a price increase for .com domains when its current price cap agreement with the US government expires on November 30, 2018. A price increase would take hundreds of millions of dollars out of domain owner pockets to generate even more profits for Verisign. Join the ICA and say “NO” to a .com price increase! Verisign Poised to Ask for a Raise? In beautiful Reston, Virginia, Verisign Inc.’s 1000+ employees are hard at work maintaining the .com registry which it is entrusted with on behalf of all Internet users. Verisign, a public company with a market capitalization of over $16 billion and 2017 net income of US $457 million, enjoys the exclusive right to be the registry operator for all .com and all .net domain names pursuant to a contract with ICANN, the Internet Corporation for Assigned Names and Numbers. ICANN is a California-based not-for-profit corporation that is in charge of managing the world-wide domain name system. This .com exclusive right is the result of a Registry Agreement between Verisign and ICANN. The current and most recent agreement commenced in 2012, but Verisign has been the registry operator for all .com and .net domain names since 2000 when it acquired Network Solutions. Verisign’s 2006 contract gave it the right to increase .com prices 7% in 4 out of the 6 years of its contract. It agreed to a similar deal with ICANN in 2012, only to have the U.S. Department of Justice step in and say that the new six-year contract shouldn’t have price increases. That fixed the wholesale price of .com domain names at $7.85 per year. On September 15th, 2016, ICANN’s Board approved the extension of Verisign’s .com Agreement and simultaneously approved an extension of the existing $7.85 ceiling on .com wholesale prices through 2024. The wholesale price is the price that Verisign charges registrars such as Godaddy and Tucows. Any increase in the .com wholesale cost would be pased along by the registrars to domain name registrants. But the so-called Cooperative Agreement which the U.S. National Telecommunications Information Administration (NTIA) imposed on Verisign, is set to expire on November 30, 2018. If NTIA does not extend the Cooperative Agreement or does extend it but with a different pricing control, .com domain nameownersmaybefacing a steep price increase. Importantly, until November 30, 2018, under Amendment 32 to the Cooperative Agreement, Verisign is entitled to seek removal of the pricing restrictions if it demonstrates to the Department of Commerce that market conditions no longer warrant such restrictions. Verisign will be deemed to have made sucha showing upon demonstrating that competition such as from other top level domains, or other factors are sufficient to constrain Verisign’s pricing of .com’s at the current price. Moreover, if the NTIA Cooperative Agreement is simply allowed to expire, Verisign may attempt to obtain a totally unjustifiable raise for itself. Do Market Conditions Warrant a Raise for Verisign? We’re not exactly sure how Verisign can ask for a price increase with a straight face. Verisign has actively put their “monopoly-like” profits to use to drive up their stock price. Millions of domain fees have been spent – not on improving their products – but on buying back their stock, increasing their share price over 300% since 2013 and generating reported 7-figure compensation packages for their senior executives. .Com domains are considered the global standard for online branding. The market value of .com domains reflects that .com domains are perceived differently from any other extension. A .com domain will have a market value at least TEN TIMES higher than a corresponding domain in a different extension. This demonstrates that the market perceives other domain extensions as qualitatively different from .com. In effect, a .com domain is a different product from a domain in another extension, and you cannot substitute between domain extension without a substantial loss of utility. The availability of other extensions does not therefore serve as a constraint on .com’s pricing power. .Com’s dominance is demonstrated by 93% of the top 50 US websites operating from a .com domain. The threetop sites that aren’t listed under a .com domain (wikipedia.org, craigslist.org and att.net) still have the corresponding .com domain out of necessity. Despite the so-called competition from new extensions, the growth in registrations of .com domains far outpaced that of the new extensions. The arrival of hundreds of new gTLD’s has had little discernable impact on the market dominance of .com domain names. According to Verisign’s own Domain Name Industry Brief (2017), new .com and .net registrations grew by 8.8 million domains during the fourth quarter of 2017, whereas the growth across all other gTLDswas only 3.1 million, thereby demonstrating that .com continues to beat all other gTLDs in growth. In its Domain Name Industry Brief, Verisign acknowledges that new gTLD registrations actually decreased by 2.4% compared to the third quarter of 2017, and that new gTLDs decreased by approximately 5 million domain name registrations, or 19.5% – in contrast to the 2.9% growth of .com and .net gTLDs. Clearly, market conditions remain extraordinarily favourable to Verisign, with new gTLDs having no appreciable impact on .com registration rates, and posing no significant competition whatsoever. If there were any factors which negatively affected Verisign’s market conditions, a decrease in the .com price would be expected to increase demand. Yet in the absence of market constraints on .com prices, Verisign’s attempt to raise prices increases what some describe as an unjustified “monopoly-like tax” on those using .com domains, who are unfortunately a captive market of a large and powerful company. What Can Be Done to Stop the .COM “Tax”? We, the millions of .com domain name registrants all over the world, stand to lose the most from a .com price increase. Verisign may be counting on individual registrants not making a fuss about an extra dollar or two a year, and hoping that nobody will calculate the collective millions that Verisign stands to reap from a .com price increase. Perhaps NTIA is hoping that nobody is paying attention, and that the millions of American domain name registrants will not blame their elected representatives for Verisign taking what some believe, is advantage of their position as the exclusive operator of the .com registry. Perhaps ICANN is thinking that it can squeeze an extra “tax” out of a .com price increase, to provide itself with even greater funding off the backs of Internet users. We must not let this happen. Imagine waking up on day in November to find out that the Verisign announced that it had completed a back room deal with the NTIA, and your registration and renewal fees were going up, year after year, for no good reason. This can easily happen if we are not paying attention. But we are paying attention. We will shine a light on any attempt by Verisign and the NTIA to increase .com pricing. 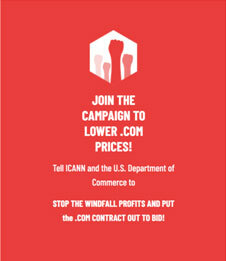 Visit StopthePriceIncreaseOf.com to learn how to make your voice heard at ICANN, at NTIA, and at Verisign. Founded in 2006, the Internet Commerce Association is a non-profit trade organization representing domain name investors, website developers and related companies. The ICA is made up of responsible businesses and individuals who have joined together to improve public confidence in Internet commerce. Based in Washington D.C., the ICA’s mission is to assist with the development of domain name related policy and to advocate for fairness in government policy and regulation.